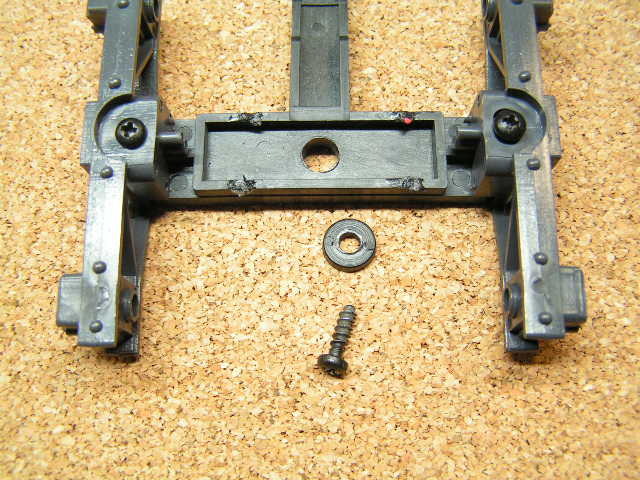 Does anyone know of a place to buy the little black plastic washers that are used to fasten LGB 2 axle trucks? They must be 3/8th inch diameter to fit into the truck frame.......see the photo. Bill - I have a whole container of various sizes of metal washers. Sure, I know how to come up with lots of workarounds and already thought of using small metal washers.......even plumbing washers but too large. The LGB unit is about 1/8 inch think so I'd have to place or glue several of the flat metal ones together to simulate it. But a friend of mine recently bought an LGB flat car on eBay without the trucks. He ordered a set of trucks but they don't come with screws or the washers. So, I'm curious where to find the ones LGB uses.......I haven't found a close match on Google, LGB online stores that carry parts, Home Depot, Micro-Mark, etc. So, for me, it's more of a challenge that I want to find the little buggers! Try an electronics supplier. They sometimes supply them as insulators. Probably white nylon but still similar. How thick the washer is doesn't matter...unless it somehow is over 1/8th" thick....!! The main size limitations are the hole size, and width...whether it is stainless steel, brass, plastic, nylon, or metal of some type is of no consequence. I bought a bunch of them at a local hardware store a while back, for less than $2...Canadian. We also have a "Fasteners" store in the area, where you can find things like these washers of yours by the Ton....!! Just because it happens to be an LGB product, doesn't mean it has to be in a [MODS EDIT] LGB plastic bag, to do the intended job. Just because it happens to be an LGB product, doesn't mean it has to be in a bloody LGB plastic bag, to do the intended job. Hm think that could be a little cruel Fred. The logic of trying to source a Plastic or Nylon Washer is quite Sound as a Metal One is likely to create wear exactly why LGB used a Plastic one in the first place. Tom try to source Nylon Washers, Squires in UK certainly supply them in a variety of Sizes. A Webb search ought to find a US Stockist. Heck, guys…Bachmann uses a wide headed screw (Metal) without a washer, so did Aristocraft, and after 20 years or more of use, with less durable plastic in their trucks (Bogeys) I've yet to see any wear...in fact, if the oil you suggest using, isn't plastic compatible, like "Three in One", or sewing machine oil; will do more damage than a simple metal washer, in that position, on the bottom of the piece of rolling stock. In fact the only time it would be rubbing hard enough to do damage, is if it was tightened too much, and the thing wouldn't swivel freely. Good at stirring shite, under all conditions, always with a smile on my face....!!! Following advice from Jon (Dunnyrail) I bought a batch of M3 black plastic washers from Amazon a month or so ago. They were posted from China, so would I guess be available in the US too. Only cost a couple of £. Thanks everyone for your great suggestions for substituting the LGB plastic washers for screw for fastening LGB two axle trucks. Joane Tillmann at TrainLi.com does carry the actual item from Marklin so I've order 20. I'll put 10 into my repair parts inventory and send 10 to my customer in Colorado. But most of everyones' ideas appear to be doable as a substitute for the original washer. Glad that worked ok for you, probably much cheaper than a UK Supplier via a Catalogue knowing UK Postage Costs.